Makhane ki Kheer Recipe – phalahari kheer recipe that suitable for Navratri fasting or vrat or any upwas days. Makhana or phool makhana also known as foxnuts or puffed lotus seeds. Makhana or foxnuts are very healthy for you and easily digestible. Also it has some medicinal properties hence used in Ayurveda. Check out more details here about phool makhana. During fasting, we mostly eat potatoes or sabudana recipes which is full of carbohydrates. So it is important to balance our diet by including makhana or dried fruits or nuts or fresh fruits. I do make makhana dry fruit namkeen as well. This provides enough energy during the vrat. Makhane ki kheer can be served warm or chilled just like any other kheer. The sugar quantity mentioned below gives medium sweet as we don’t like our desserts too sweet. If you like you can add more sugar as per your liking. 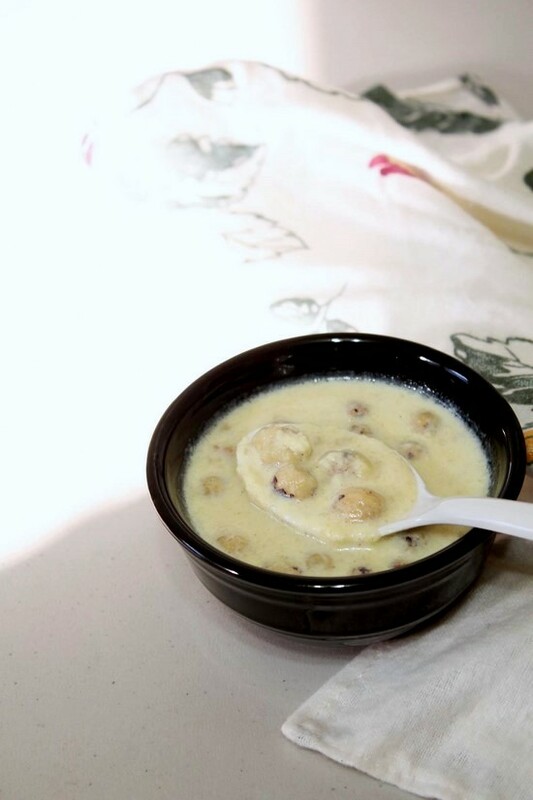 The method of making this makhana kheer is similar to other kheer recipes. 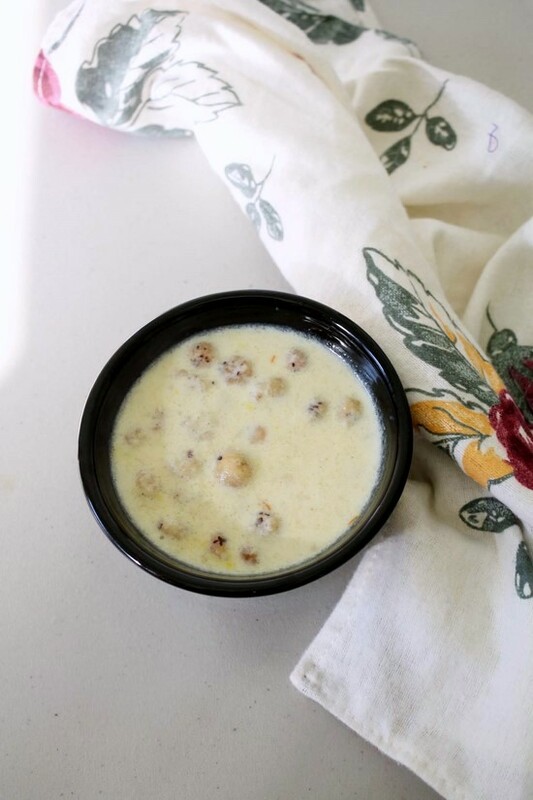 It is very easy yet delicious and healthy kheer recipe that can be enjoyed on regular days as well. You don’t need to be on fasting. 1) Take milk in a deep sauce pan on medium heat and bring it to a simmer. Keep stirring in between so milk doesn’t stick and get burn to the bottom of the pan. 2) One another stove, heat the ghee in a pan on medium heat. Once hot fry cashew nuts till it becomes golden brown in color, Remove it to a bowl. 3) In the same ghee, fry raisins till they get plump up. drain ghee and remove them in a same bowl with cashews. 4) Keep this aside till needed. 5) Don’t forget to keep an eye on milk. It starts to simmer, keep stirring at intervals and keep simmering for 7-8 minutes or till it gets slightly thick. 6) Now back to other stove, In the remaining ghee, fry the makhana with moving them constantly. They should be light brown and toasted. They will become crispy. 7) Remove it to a bowl or plate and let it cool to touch. Don’t forget the milk at the same time, otherwise it can get overflow. 8) Once cooled, break some of the makhana into coarse powder, you can do it by your fingers and thumb. This will help to thicken the kheer. 9) Now milk is simmering for 8 minutes and it it slightly thick. 10) Add pinch of saffron. 11) also add prepared makhana. 12) Let it simmer for 4-5 minutes. 13) Then add sugar and let it simmer for 2-3 minutes. 14) Lastly add cardamom powder. 15) and fried cashews and raisins. Turn off the stove. 16) Stir well and kheer is ready to serve. Try this kheer once and let me know how you like it. Happy cooking! Serving suggestion: Serve as a dessert after your meal during the fasting days or vrat. This can be consumed on regular days as well. Take milk in a deep sauce pan on medium heat and bring it to a simmer. Keep stirring in between so milk doesn’t stick and get burn to the bottom of the pan. One another stove, heat the ghee in a pan on medium heat. Once hot fry cashew nuts till it becomes golden brown in color, Remove it to a bowl. In the same ghee, fry raisins till they get plump up. drain ghee and remove them in a same bowl with cashews. Keep this aside till needed. Don’t forget to keep an eye on milk. keep simmering for 7-8 minutes or till it gets slightly thick. Remove it to a bowl or plate and let it cool to touch. Once cooled, break some of the makhana into coarse powder, you can do it by your fingers and thumb. Now milk is simmering for 8 minutes and it it slightly thick. Add pinch of saffron and prepared makhana. Let it simmer for 4-5 minutes. Then add sugar and let it simmer for 2-3 minutes. Lastly add cardamom powder and fried cashews, raisins.